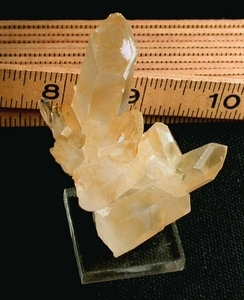 Transparent to translucent, this miniature size [2-1/4x 2-1/8x 1-1/4" tall] deep Golden Healer cluster has a white quartz chrysanthemum over the main point's channel face - its' delicate detail easily seen with your 10x loupe. Three crystals including the main have uncommon 7h faces. One crystal is a very rare 8h faced. There are plenty of record keepers as well as a few bright rainbows...including within the conchoidal bruise to the back of the main crystal. The intergrown and regrown base sparkles gold and white [where no iron compounds were included in growth]. Collier Creek Mines, Montgomery County, Arkansas.